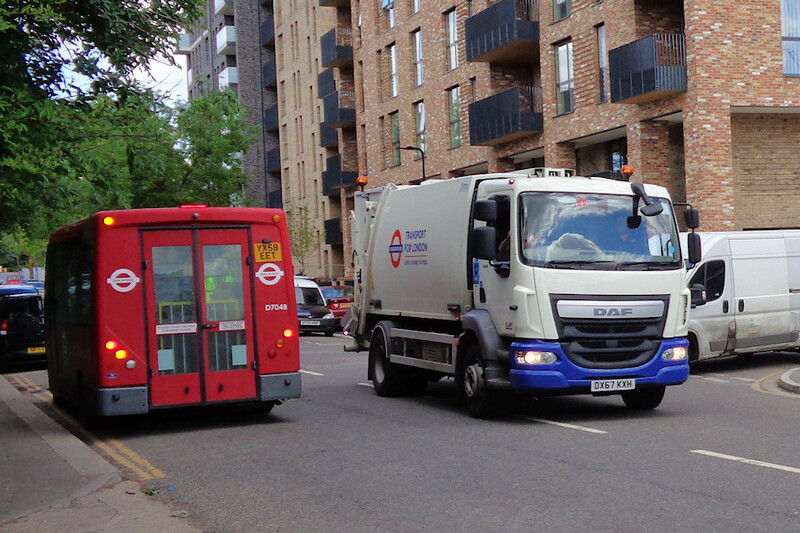 Details: Two new DAF LF dustcarts were added to the LUL fleet in October 2017, replacing similar (but plain white) DS16YNU/YNV. I first saw DX67KXJ in the lorry yard at Acton and I thought it carried full white/blue/red livery. Photos of the pair were notably absent until Ray caught DX67KXH coming down Bollo Lane on 10th May 2018. This shows that this one at least carries a partial livery, being all white apart from the blue front bumper. I will double-check the livery on DX67KXJ next time I am passing Acton. On the left is London Dial-a-Ride minibus D7048. There are 229 (originally planned to be 400) of these Volkswagen Transporters with Bluebird Tucana bodywork.